Hello and welcome to part 16 in the series of 101+ content generation ideas. Today we'll be talking about using Google to come up with ideas for content. And not just searching in Google for your related keywords (although that can help to come up with content ideas just from what you find). But using Google in another way instead from suggestions and related searches! Now a lot of people that are searching for content generation ideas in Google think that it's only used for searching for stuff with it. And it is, but they don't realize that it's not so much about the search results that are actually returned to you, but that it can be used in other ways for coming up with content generation ideas. Other ways that include using the Google auto suggestions and related searches. Because when you search for anything in Google, or start typing something, Google will auto suggest something for you based on what it thinks you are searching for that might also be helpful to you and save you some time in not having to type out the full search term that you want to search for. As you can see from the below screenshot. When I start to type "content gen" into the search box, Google auto suggests search terms for me based on what it think I'm going to search for. As you can see, Google has auto suggested some other searches that are related to that. The thing is, this can be done over and over again for many different keywords. And all it really takes is some experimenting. Just head on over to Google and start typing some words into the search box that are related to your niche. 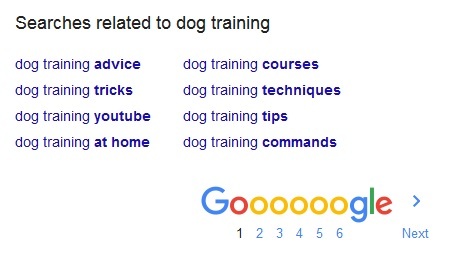 Let's say that we want to come up with some ideas for content based on dog training. As you can see, Google has auto suggested some related search terms related to this search for me. These other related search terms that it's automatically suggesting are useful in coming up with content generation ideas. I can see one on there that would be good to cover and that's the "dog training classes near me" one. I could do a post on that and cover some dog training classes that are being held near me. And the same logic can be applied for the other auto suggestions too. Now another way that Google can be used for coming up with content generation ideas, is to do a search for something, some keywords related to your niche. And then look at the bottom of the search results. You'll have to scroll right to the bottom of the page but Google should be showing a little box with some searches related to your keywords. Pretty neat right? These related search terms aren't always the same as the auto suggested search terms either. So you can look at these and think about how you can use them to come up with content generation ideas. The one "dog training commands" could be a great topic to cover! But you can find more than the ones that are shown by simply searching for another keyword. 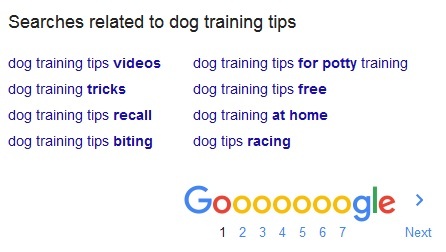 I've done another search for "dog training tips" and the related searches have changed a little. Now it's showing us different related search terms. And some of these could be very good topics to cover. 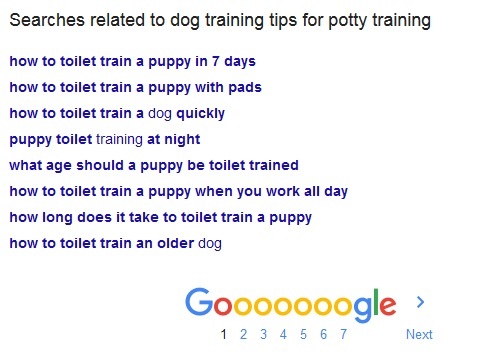 Like the "dog training tips for potty training". The thing is, if you click on that one and then scroll to the bottom again, Google will show even more related searches. But here's the thing, Google knows what you're doing now. And now it will start to show you some very good related searches that are excellent for coming up with content generation ideas as you can see. Now we're talking right!? Remember, Google is your friend and it wants to help you just like any good friend does! But this is one way that you can use Google for coming up with great topic ideas. Click on any one of those related searches above and it will show you even more related searches. Using this method alone over and over again will give you many many great topic ideas for content generation purposes! And that's basically how you use Google auto suggestions and related searches for content generation ideas. Do you use Google in this way for this reason? What other ways can you use Google for this reason other than looking at the search results? There are so many youtube videos where the youtubers just use Google's suggestions to see what is the stupidest thing that they can come up with. But it can actually be quite useful if you know how to use it correctly. It can be a really good thing to come up with some content ideas because of the fact that most of the things that it suggests have been searched for quite a lot and maybe trending at the moment as well. So it is definitely a good way to come up with content ideas that will be well received by your users. I sometimes use Google suggestions but not for content writing. It is usually related to my travels like hotels or interesting places to go. In our trip to Taipeh, Taiwan last October, I was surprised to know that there were several Tango hotels there. And I learned of it because of the suggestion. Without knowing, we would have lost our way. That also happened in South Korea last November because there are also 2 Tmark hotels. Again, we would have lost our way.